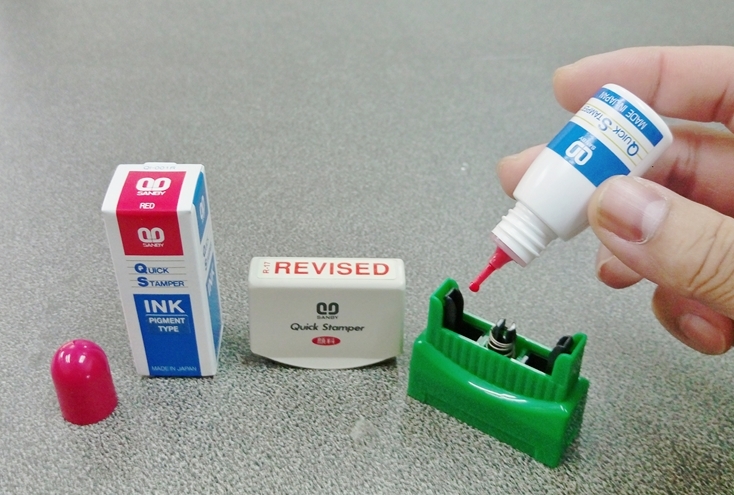 How to Re-Ink | Quick Stamper | SANBY (THAILAND) CO., LTD. When the imprint starts to fade, you can re-ink the stamp easily using 3 steps below. 1) Pull the handle off the stamp. 2) Add 4 – 5 drops of ink into the ink reservoirs. 3) Replace the handle and keep the stamp upright for an hour or so to allow the ink to evenly distribute throughout the ink pad (4 – 5 hours recommended for best efficiency). ● Over-inking may cause overflow of ink from rubber stamp. ● Take care not to slant the stamp or turn it over instantly after re-ink. ● Check the ink type and color carefully before re-ink. ● Use genuine SANBY’s refill inks only. Other refill inks may cause clogging of ink pad.